I have to count my Blessings that I’m through almost half of the Blogging From A to Z Challenge. It’s been a real challenge in more than one way. Today I’m also participating in the 52 Snapshots of Life Photo Challenge hosted by the Lazy Pit Bull and that theme is Blessings. L can stand for Life or Lazy something I’m not. Even though they’re not the overly religious type, Pop and TW count their Blessings every day that with all the cats at the shelter, they picked Moi! The Blessings in my Life are many: a warm condo, three squares a day, a Pop to FURminate me, many toys and scratching posts, this blog and two communities to call my furrends—the Twitter Anipals and Cat Blogosphere. I also have a family that adores me—actually, after yesterday’s post that they thought was ha-ha funny, I’m not so sure anymore. They have made my Life more inneresting and I hope I’ve enriched theirs. All my readers are Blessings. I know I’ve said that before but I can’t say it enough. 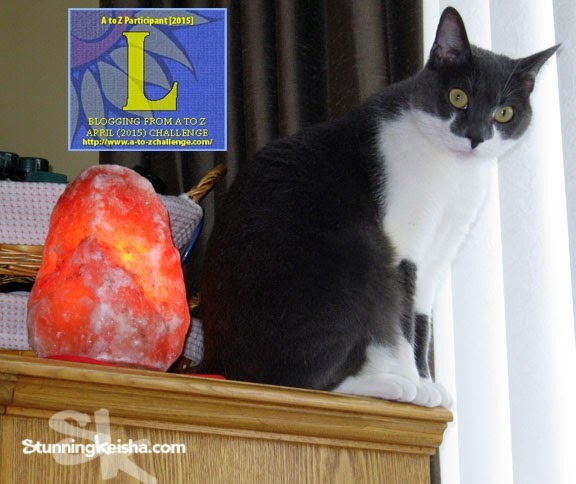 L is also for Lamp and this is a great time to give you my affiliate link to the Himalayan Salt Shop. They sell salt lamps and much more. Your cat will look stunning next to one of these big orange rocks salt lamps. My adoptable cats today are a package deal. This is Luci and Fred. I originally wanted Fred for the F’s cos that’s my Pop’s name but permissions came too late. Both are Siamese mixes. Luci is a very sweet and extremely playful little imp of a tuxedo! She is one of Maizy's kittens, and the MOST athletic. She can readily spring to 10 times her height in a flash, and all you have to do is move a toy and THERE she is!!! When you recline, Lucy likes to dance across your collarbone before curling up to nap on your left shoulder. What a purr this tiny package has!!!! Luci is a very petite girl, and is rather shy in new places. But once she settles in, she is very brave and loves to approach you for treats and cuddles, especially if she thinks you might get up and play with her as a result! That's only fair, isn't it? Luci would like to be adopted together with her brother Fred, who is her favorite hiding spot! Fred is a timid but adoring gray boy who likes to cuddle in your arms or next to your ear when you lie down. Their mom Maizy is a four-paw declaw wedgehead Siamese girl who was put outside when she went into heat. This poor baby gave birth to four kittens under a shed. These poor kits began feral, but you would never know it the way they've blossomed under our volunteers' care. They're reformed and ready to cuddle! 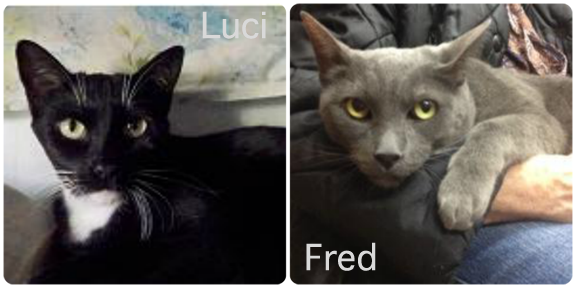 Both Luci and Fred are available from New York City Siamese Rescue, small group of volunteers who find homes for orphaned and abandoned Siamese Pointed and Snowshoe cats and related breeds, such as Tonkinese, Balinese, Birman, Ragdolls, and Himalayans. 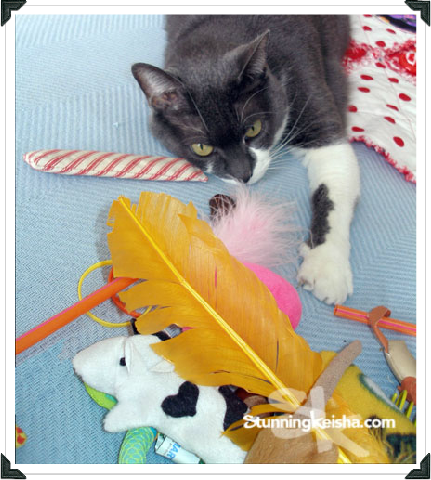 To learn more about them and see the rest of their adoptable cats, visit their web site. FTC disclaimer: This post contains an affiliate link. Luci and Fred are so beautiful. They just need a chance... a loving forever home and we're sure they'll absolutely flourish. You are really doing a great job with the A-Z challenge, CK! It is not easy... which is why my human and I had a meeting and decided not to do it. We wish them the best of luck. Have a terrific Tuesday. You sure do have a lot of blessings to be thankful for, CK! You are sure right about the blessing thing CK. Hey, we hope that cute couple gets adopted soon. Oscar is head to a no kill shelter so he is safe. He still needs a home. Life is really a blessing and you are blessed with loving (even after yesterday's post) family and home! We sure do hope Luci and Fred find their forever homes very soon. And together. (Luci & Fred are just precious!!! Life is a blessing.....so are friends.....congrats on getting halfway through the alphabet too CK! We love your posts for the challenge! Paws crossed all the kitties get a forever home. I count my blessings that my vet has tried so many different things to get me feeling better and that my mum and dad told me they would never give up on me. I also count my blessings that I got to know you. I hope those sweet kitties get their home soon. Your are truly blessed. I hope those sweeties get their forever home soon. Purring and praying for Luci and Fred to find their happily ever after very soon. I think we're all pretty blessed. I hope Luci and Fred find their forever home quickly. They look like very dignified kitties. Luci and Fred - you hang in there - you furever home am coming... After all, Life is indeed a blessing. I am lying here dictating to the Typist (Affiliates notwithstanding!) and I am definitely counting my blessings, CK! Those kitties, especially ... ahem .... Luci, are very cute!! I hope that cute couple gets adopted soon !! Luci and Fred are beautiful! Sharing. I may be commenting again but I SO want Lucy and Fred to find a home. CK My admiration to you and Mum the A-Z challenge is tough tough tough but this little ghetto Kitty is blowing them out of the water.